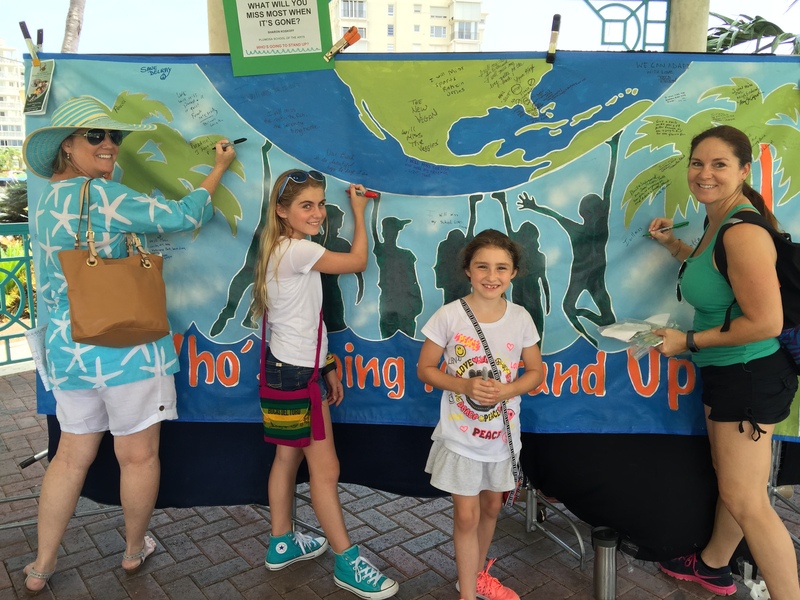 Delray Beach’s HighWaterLine project did its art magic on Saturday, April 25, 2015 as the city’s observance of Earth Month 2015. 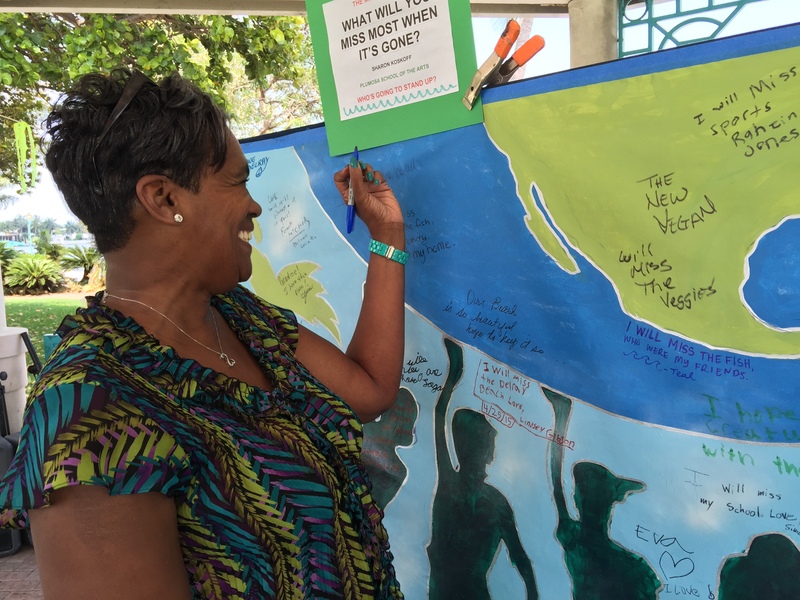 The project was part of a broad initiative supported by a coalition of non-partisan non-profit organizations (the Climate Action Coalition of South Florida) to engage the public in dialogue about the social ramifications of sea level rise and extreme weather. An important priority for the project was to increase grass roots support for integrating the recommendations of the Southeast Florida Climate Action Compact into comprehensive plans of Palm Beach County and all its municipalities. Delray Beach was chosen as the HighWaterLine project site because it is one of the first cities in Palm Beach County to pass a resolution in support of the Southeast Florida Climate Change Compact (Mayor’s Climate Action Pledge – Delray Beach), has begun adaptation efforts, and has appointed a citizen task force to make recommendations regarding sea level rise. 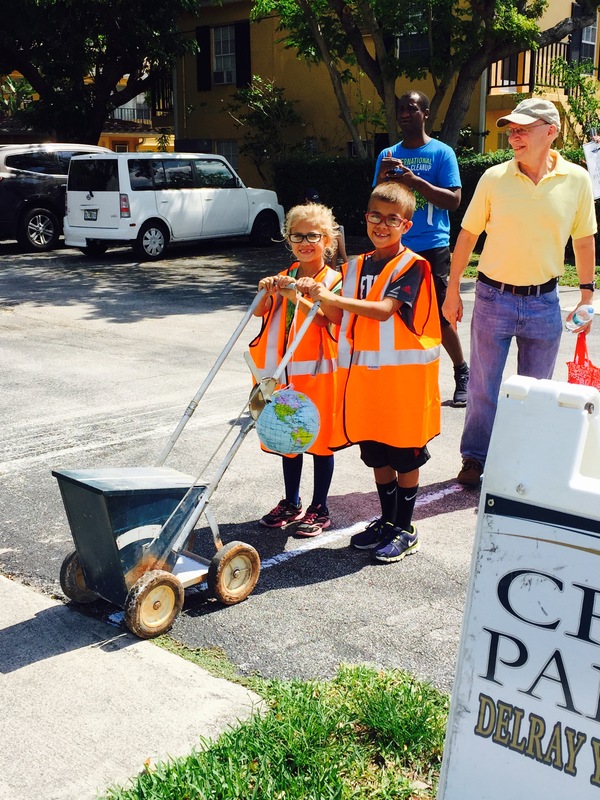 The focus of the project was on the city’s history (Delray Beach historical timeline). The HighWaterLine was therefore chalked in three historic neighborhoods at significant risk due to rising water. 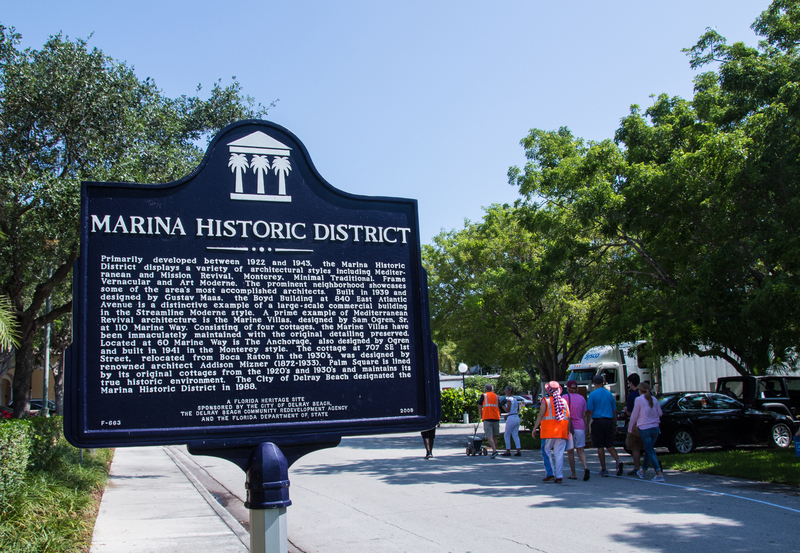 The historic neighborhoods were highlighted in order for the public to understand the history that could be lost if sea level rise, and other climate disruptions, proceed without the planning suggested in the Southeast Florida Climate Action Plan. “Frog Alley,” the city’s historically black community, founded in 1900 by Bahamian workers recruited to work on building the railroad and in the pineapple fields. Frog Alley is currently under consideration as an historic district. The HighWaterLine Delray Beach project featured four all day simultaneous art interventions, from 7 AM to 10 PM, located along the chalked lines in each of the chosen neighborhoods. The purpose of these art interventions was to draw public awareness to the chalked lines in these neighborhoods, where the water is likely to rise significantly (up to 4 feet above sea level) over the next decade. the city’s excellent park system, especially those parks that would be seriously impacted by a four foot sea level rise. In the six parks targeted, an art treasure hunt was fielded. Crews hid (in plain site), small hot pink tiles attached to tiny pink flags. Visitors to Veterans’ Park at water’s edge on the city’s main street, Atlantic Avenue, were encouraged to visit one of the parks, find a pink “talisman” and return it to receive a 6”x6” tile painted by a local artist with a design, representing something that will be lost when the sea takes over. Tiles were awarded after each successful treasure hunter explained, on video, what they would most miss most in the park they visited, when the park was no longer useable due to sea level rise. selected stormdrains, two or more in each of the targeted neighborhoods, that are either already overtopping in major rain events, or will be, as the seas rise. 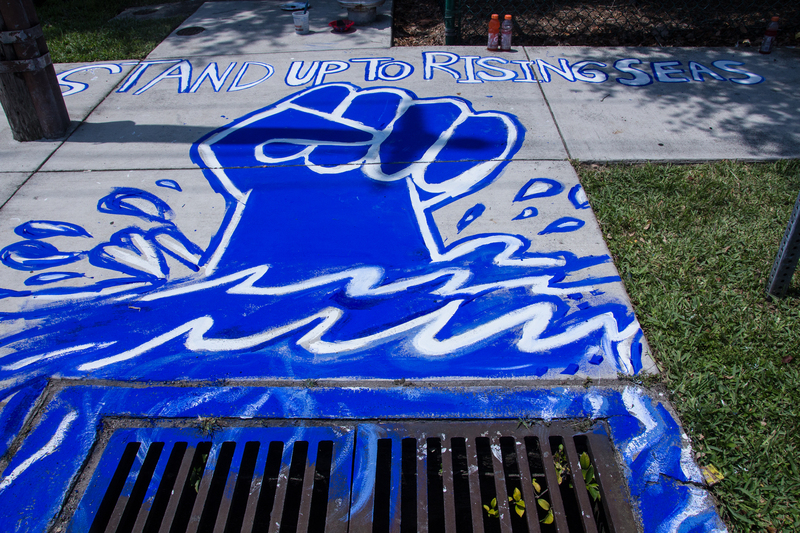 An artist team, assisted by community members and youth from the area, completed seven murals at problematic stormdrains in each of the three targeted neighborhoods.The murals, painted on the street, with nontoxic tempera, called for action on infrastructure improvement, water conservation and adaptation. The targeted stormdrains were selected by city staff. a “blue light procession” lighting the three neighborhood chalked lines at night as the culmination of Delray Beach’s HighWaterLine observance of Earth Day 2015. 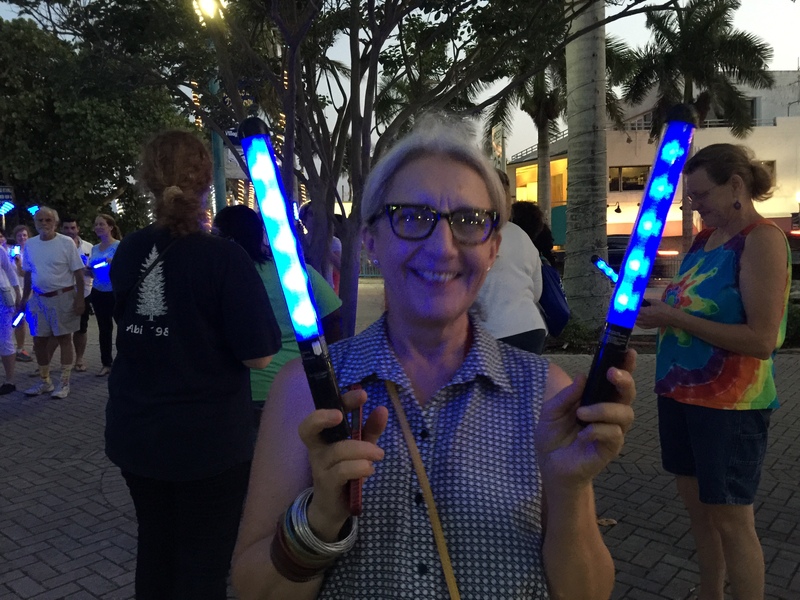 Residents and visitors lined up along all three lines at dusk, switching on blue LED lights as the sun set, then, in procession, moved along the lines and down the city’s main street, Atlantic Avenu, to Veterans’ Park. Here, to a live band’s rendition of Neil Young’s Earth Day anthem, “Who’s Gonna Stand Up for the Earth,” a community dance “blue light” finale choreographed by Dale Andree, founder of National Water Dance, was performed, featuring dance phrases recalling the movement of water. Also occurring simultaneously throughout the day were canvassing efforts to gather information on citizens’ perceptions about the threat posed by sea level rise, to be used in policy advocacy efforts and scientific research; and the gathering of personal oral histories recorded on videotape. The oral histories will be available to researchers in the archives of Delray Beach’s African American history museum, The Spady Historical Heritage Museum. Any views, findings, conclusions or recommendations expressed in HighWaterLine Delray Beach do not necessarily represent those of the Florida Humanities Council or the National Endowment for the Humanities.